Enjoy September on these 5 Alberta Waterbodies! September is the perfect month to get outside and get to the water. While it may be getting a bit more chilly, now you can dig your favourite sweater and toque out from storage, bundle up, and face the great outdoors. Spending time outside is proven to be great for social, physical, and mental health. This is particularly important as the school year starts up. Getting to the water is the perfect opportunity to gather with friends and family, it can improve your mood, it gets you moving, it calms the mind, and it’s just plain fun! There’s no snow on the ground. The lakes have not frozen. Now is the time to get outside! Alberta is feeling the chill of seasonal change approaching, but summer is far from over. September is a prime time to get outside and take advantage of the many lovely walking and biking paths, the perfect water for paddling, and maybe even brave the cold water for a dip. 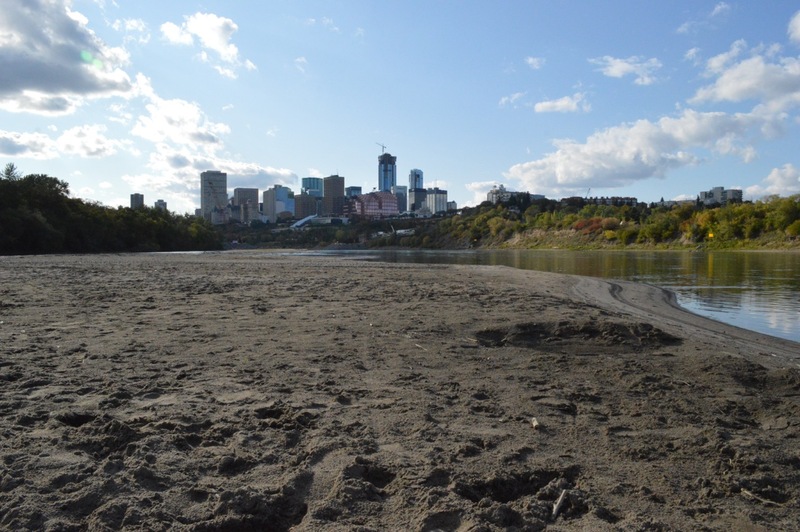 While the City of Edmonton might not be moving forward with constructing a permanent beach along the North Saskatchewan River, that does not mean that Edmontonians cannot get out to the water. There are 22 major parks along the river, forming the largest expanse of urban parkland in North America, and an abundance of space for activities. For ideas of beaches to visit in one of the sunniest provinces, here are a few of the most popular beaches in Alberta. For more ideas, check the Swim Guide or read on. Elk Island National Park is located a quick 30 minutes away from Edmonton. If you like hiking, paddling, or seeing wildlife, this is a trip you might want to take this September. You can pack a picnic while gazing out on Astotin Lake, and if you have young ones with you (or the young at heart), build some sandcastles on the beach. There are also 11 hiking trails of various difficulties to immerse yourself in the fresh air. If paddling is more your scene, on the weekends you can rent a canoe, kayak, or stand up paddleboard; if you have your own boat, bring it along for some quality time out on the water. Elk Island is also home to many different creatures of all different shapes and sizes, including bison, elk, beavers, and the tiny boreal chorus frog. You will have to keep your eyes and ears open to witness some of these amazing creatures. Is it possible to go swimming in September? Absolutely! The Wabamun Lake Provincial Park Beach is another quick trip from Edmonton for a day full of activities. The beach has plenty of space to play in and out of the water. If you prefer birdwatching, you may be able to spot herons, bald eagles, hooded mergansers, and more. It’s also a great location for fishing, many anglers rave about the pike and walleye in Wabamun Lake. For a Rocky Mountain Adventure, why not trek to Maligne Lake. There are many lakes and rivers to choose to visit in Jasper National Park, so why not visit the largest? The 22km long lake is a fantastic spot to go paddling or for an epic hike. They have easy and difficult trails to take you to the tops of mountains. There are a variety of campsites at the lake, as well as many other sites around Jasper. There are a variety of activities that are still available in the surrounding area including horseback riding, mountain biking, paddling, fishing, and even traction kiting. 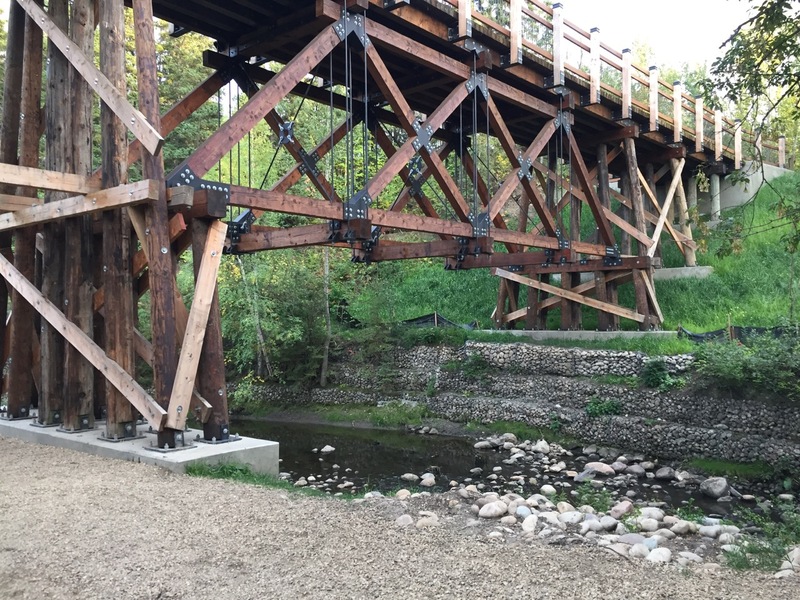 Flowing right through Edmonton, the Mill Creek Ravine is a stunning location for a hike, for mountain biking, or for a dog walk. It’s a popular site for dog owners since there is an off leash dog park. But there are also sites for picnicking, so bring a snack to enjoy the beauty of the creek. The paved trails are accompanied by bridges to cross over the water with ease. This is a great location to escape from the hustle and bustle while still being located right in the city. While it may not be the most accessible of beaches, the sand has returned once again this year. This year Accidental Beach (also known as Cloverdale Beach) did not have as many people come by, but it is still a great spot to visit with friends and family. Last year’s water testing showed high levels of E. coli, so bathe at your own risk. But the view of downtown from the water is reason enough to visit this accidental sandy beach. I’ve lived on the banks of the North Saskatchewan River since I was 7 years old. At the time, I didn’t realize how fortunate I was to grow up on such a unique property, so close to this amazing body of water that feeds the city of Edmonton. My cousins and I spent countless hours swimming and canoeing in the river. My parents bought a ski boat and along with their friends, we would waterski, swim and picnic all summer long. My parents, with their gymnastics backgrounds, were quite often asked by the city of Edmonton to come downtown and put on waterski shows during festivals and events. In the winter, my father would clear a patch of the river so we could ice skate and we would also cross country ski along the banks for hours. Now that my husband and I own the property and my kids are growing up here, we realize how lucky we are to be living on the banks of the North Saskatchewan River. It has changed a lot since I was a child; now having walking trails, walking bridges, and boat launch sites for all Edmontonians to enjoy. Nine years ago, my friend Karen Percy Lowe invited me to the Waterkeeper Alliance Gala in Banff and we both decided we needed to walk the talk. We have this amazing body of water; a glacier-fed river that flows east from the Canadian Rockies and, eventually, into the Hudson Bay. That is what prompted me to get involved and protect our drinking water. So, I became one of the founding members of North Saskatchewan Riverkeeper to help keep our waters swimmable, drinkable, and fishable. Every day our family wakes up looking at the river and its surroundings and feel very blessed to live on such a beautiful body of water: The North Saskatchewan River. Britt has always been closely connected to the North Saskatchewan River. Since the inception of North Saskatchewan Riverkeeper, Britt has been an advocate for swimmable, drinkable, fishable watershed. She is currently the Vice President and Treasurer of North Saskatchewan Riverkeeper. Today, Britt is the president and owner of Physique Fitness Stores, Alberta’s premier retailer of fitness equipment. She continues to nurture her connection to the river with her husband, Craig, and two children. At tonight’s Waterkeeper Gala, Britt will be introduced as one of 12 Swim Drink Fish Ambassadors, community leaders who have demonstrated an unparalleled commitment to creating a future where every Canadian can swim, drink, and fish. Click here to learn more! Check out Britt’s story on the Watermark Archive! It’s near the end of April but still Thunder Bay is frozen in and Lake Superior’s ice and snow reflect the sun back up into the blue sky. I am here to sing at an Earth Day celebration. I walk to the end of the blustery pier and stand next to a metal sculpture with a speaker in it. I am alone but for a woman’s stark voice coming out of the speaker, saying words in her native tongue- Ice, Fire, Moose. Is it Ojibwe? Inside the Harbour Centre I study a perfect replica of a Laker, with miniature cranes, wheelhouse, and cargo containers. The long history of moving grain and other goods out of this water trailhead is evidenced in the black and white photographs on the wall of shipbuilding and ribbon cutting ceremonies. Sarah Harmer is an award-winning Canadian singer-songwriter and activist. Click here to check out this and Sarah’s other Great Lake Watermarks on the Watermark Project archive. North Saskatchewan Riverkeeper is proud to be a part of the Watermark Project, preserving our national water heritage through storytelling. To submit a Watermark of your own click here. Here we were a few years ago starting a tour, my band mates and I, in the wee town of Tobermory at the tip of the Bruce Peninsula, a 5-hour drive northwest of Toronto. Lake Huron washes against both sides of this ancient spine. On the west side white sand and summer beach getaway towns. On the east side the crystal blue waters of Georgian Bay. The grotto is tempting, but rumoured to be ice cold. Up on the cliff we eat smoked whitefish caught just south of here off Cape Croker; the Chippewas of Nawash unceded First Nation. Nourished by the lake’s delicious offerings we trek this rugged Niagara Escarpment and kayak the misty waters at its base. Wishing everyone a safe and happy holidays from North Saskatchewan Riverkeeper!